Something that I get asked from time to time is about Google News, and how you can get there. If you're not familiar with it already, Google feeds off of content from other sites that are thought to have high authority, and lists the news their automatically. How can we take control of this? Well, the key word there was "automatically", and that's where we come in, and essentially manipulate the system to get out page through the news barrier. The result is ranking almost instantly, and above every other natural search result; it can be compared to PPC ads, since it is on the top of the search results and is emphasized. If you like what you see so far, read on and we'll get into the specifics on how we can dominate Reddit, and similar sites, to make our affiliate links news worthy. For once, Google will be all over them, essentially begging to shoot them up above all competition and send all traffic to that one result. Sound good? Let's jump right into it! First of all, if you don't already have an account on Reddit, create one. Fake information is fine, as we won't be using this account for anything personal. 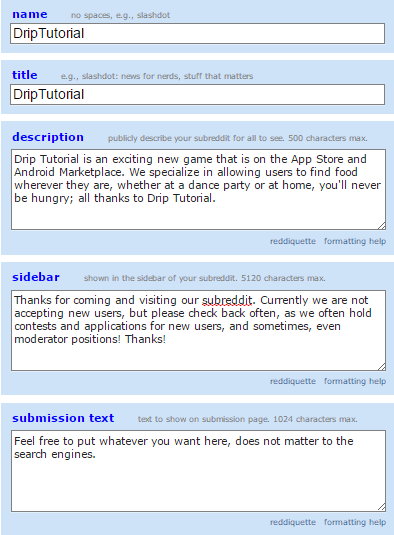 As soon as you create your account, you're going to want to create a subreddit. A subreddit is a place where we will be posting all of the content that we want to rank. Compared to posting in other subreddits, we're going to have full control over our own little section, and nobody is going to be able to remove our posts. As you can see, I put in some random information, or even leave them blank. The problem with not filling in anything at all is that Google has nothing to crawl, so putting in information that doesn't make sense can be extremely beneficial to your Google News ranking efforts. Sometimes, you will get the message: "you are doing that too much. try again in 23 hours." Normally, people think that they messed up on a step, but no need to worry. This is just Reddit's security system, so simply try again in the allocated time given by Reddit. You're given the option to either submit a new link, or a new text post. You can do either, but the method that we are using works much better when it is done with text posts, so we're going to be using that option. Keep in mind, that this method will still work if you decide to use a link, but it will not be as efficient, and won't rank as well in Google News. Once you select the text post, option, you'll see a few blank boxes, and we'll be filling these in together. As you can see, the title box isn't something that we normally fill in like this. 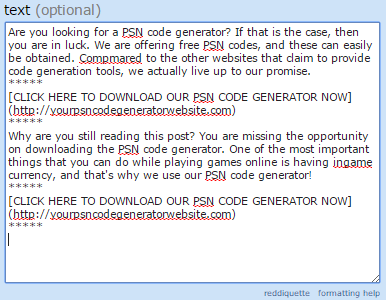 Generally, we would use "Free PSN Codes with the PSN Code Generator", but, Google seems to hate this for its news articles. It loves to have sites with "breaking news" headlines, so we're going to be creating something similar. Adding things like "completely new", "updated method", and "breaking news" will help you get indexed and increase your chances of being placed in Google News. As you can see, we're not writing much. Before the first "call to action", we're going to have around 50 words of content, and in this first batch of content, you should include the keyword around 2 times, 3 is pushing it. Now, we're going to have our first call to action. Using 5 asterisks: "*****", we're going to be able to create a new line on Reddit, this allows us to make the "call to action" separated from all of the other content. How does Reddit understand links? [Anchor Text](URL) is the format that we use, as you can see above. The call to action can be in all caps and will also end up in a nice link to our site. Now, follow the exact same procedure as we did above. 50 words of content, new line, call to action, new line. As you can see in the above image, that is all we have. We're not quite done yet, so let's head on over to UberSuggest, a tool that I love to use for keyword stuffing. Copy and paste the results, and head on over to TextMechanic. Enter an empty line in the first box, a comma in the second, and in the last, paste what you got from UberSuggest. Click "Find and Replace Text", and you'll get a nice comma separated list. Now, just paste that list in and submit the post on your new subreddit! This is what it is going to look like, keep in mind, it isn't the most beautiful thing, but it converts. Google will be all over this content, if you want to call it that, and you'll be on the Google News. 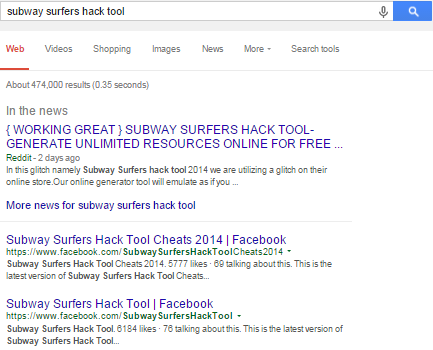 What can we do to ensure that Google indexes our post? Well, without any indexing help, Google has no paths to find our newly created subreddit or the post itself, so what do we do? If you don't have any paid indexer, do not worry. We're going to be using a site called Pingomatic. ...and that's how it's done! Usually, these rankings last around 3-4 days, and can bring in a pretty penny. This is no long term strategy, but if you need to test the profitability of a niche, or just need a few extra dollars, this is the ideal method for you. As always, if you have any questions at all, post a comment below and we'll do our best to help you out! WOW! I am trying this today. Just when I think i have info about ranking on the 1st page of Google you come out with valuable content that I always forward to. True content that I can use in the real world in real time. Wondering how I would use this to dominate the 1st page of Google for the universal local search term, for example "Restaurants in [City Name] [State]"? Maybe this technique will work, what do you think? Seems to me it is impossible to rank for that search term no matter what I do, Press Releases, .Edu back links etc, feed back? I tried making a page but literally in 10 minutes the page was banned? Any ideas? Thanks! When working with a new Reddit account with no previous activity, try to add some upvotes, comments, and browsing. This will decrease the ban rate. ok thank you i will give that a shot then get back to you i lost that account so had to make a new one but i got that wait 23 hours thing also do you verify an email or not necessary? lovely how competitive can you with this can you do the garnicia cam whatever its called or launch jacking jvnotify or jvzoo products.Is there a place to purchase old reddit accounts.This is big by the way very big usually takes press releases to do this. Thanks for sharing. I am going to try it today. And the good part is I already have a Subreddit. Just One question. 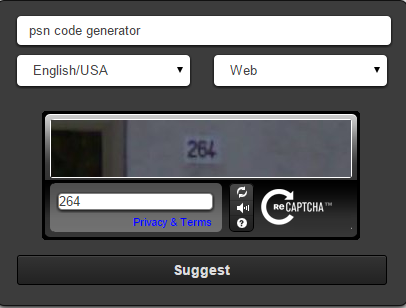 What If I create some backlinks to it. The more backlinks the better, but it's not necessary to rank on Google News. How would you exaclty monetise those? Is it file they can download or something :P? Also could you tell us any main affiliate providers you using on these methods? You just link them to your landing page. I'm using AdWork Media. Does this work for keywords of any volume? And do we have to check if there are already news on google's front page? Are these ranking lasting 3-4 days for competitive keyword or for every one I rank? For example if i rank for some small keyword that doesnt get a lot of competitors who are trying to rank for it everyday, will it still last on 3-4 day? Thanks for this awesome tip! Q: Will it work for other languages? Does Reddit accept texts and subreddits in other languages? Also, how can I get upvotes and comments? Are there exchanges? Nice! I am going to be trying this! Thank you. Should I create a new anonymous Reddit profile to do this? Just run it with the one I have now? I'm also curious as to how long these rankings typically last for. 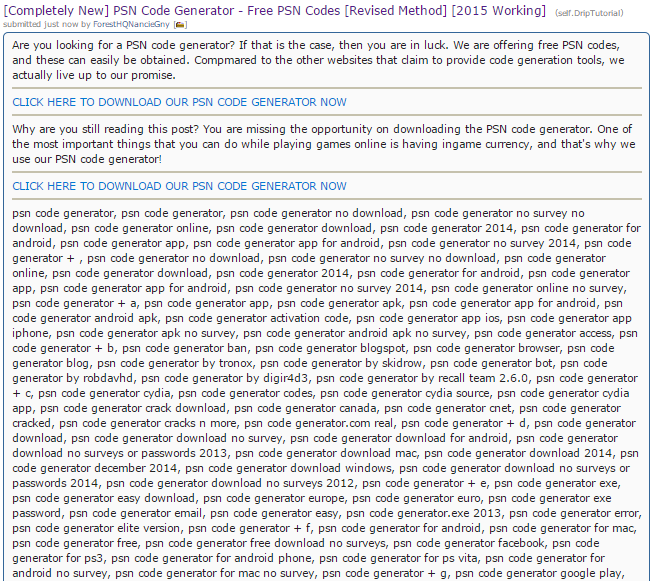 Also, I searched for everything in your example title, "free psn codes", "psn code generator", etc. and couldn't find the results in Google News. I went all the way to page 7 or 8. Where did it go? Did all the steps above yesterday and the post is not even indexed yet. ran it through indexification and pingomatic... am i doing something wrong ? 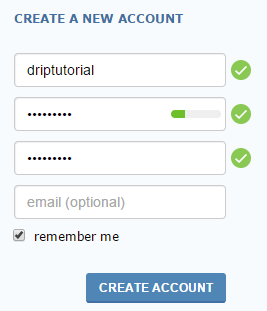 I gave it 20 minutes of my time and could never figure out how to "create" a subreddit .. totally confusing to my feeble brain ..
login to your account and click on the link "create subreddit" on this page. Thanks, this is fantastic; was a bit late getting to it. Will follow your instructions tomorrow. Awesome Adelaide, keep us updated! So you're saying to purposely NOT make it related to what you're going to link to? 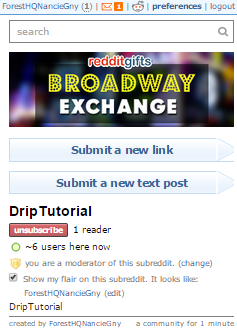 The sub itself and the content you put for its description? As long as it looks natural, you're good to go. Helps stop subreddit bans. Question: What about privacy settings, etc...? Do we want others to be able to post? 'high' is the standard filter, 'low' disables most filtering, 'all' will filter every post initially and they will need to be approved manually to be visible. Hello! Guys, is there a difference in what is a niche? low conpetetive niche or high? I did 3 text news, the third day, and the result is not present. Do I need to do backlinks or order on Fiverr - Karma pr other? I submitted mine to OneHourIndexing/OneHourBacklinks as well. OneHourIndexing allows for a few freebie submits. You can buy a large package from OneHourBacklinks to last for the month and drip out onto videos etc. Obiv in additional to your own links. The INDEXING is not happening.. 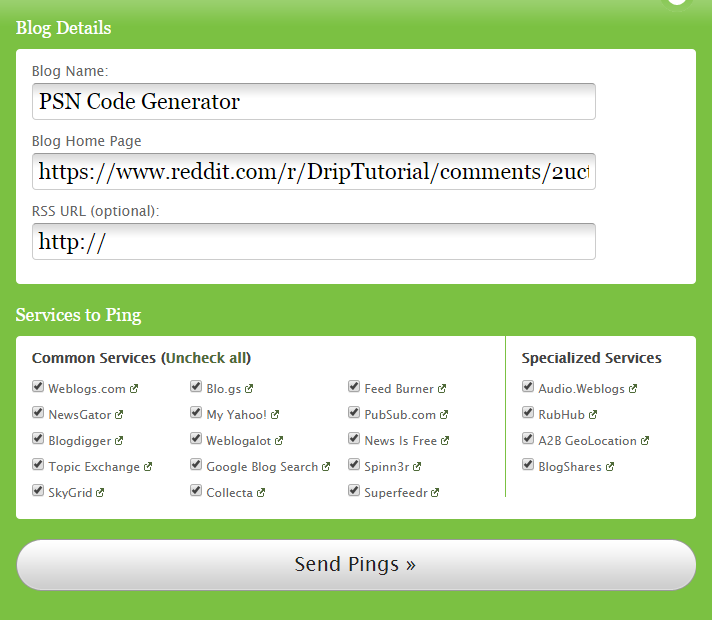 Tried with many other services beside pingomatic like google URL submit, masspinger, etc. But in vain..! You can't expect an instant index, even with WMT. Patience is key, and if you don't have it, you won't ever be successful. I wanted to know how do I manually add my own video on my private blog network domain site when using the CLOUD PBN software? Hello, i have done exactly as you said...i am very thankful to you that my lots of post are ranking second or third page itself...but i did not get any post in Google news...is there new thing i have to do? and what about better ranking? should i have some backlinks? decided to try this method. registered on reddit, posted sosme comments. but when i try to create a subredit, i get an error: "your account is too new to create a subreddit". can you suggest me how to bypass this error? Hey! Please make sure to read the full post! Now reddit requires account to be 30 days old with positive karma in order to create a subreddit. It's fine tho you can pick aged reddit acc on fiverr for $5. Is the competition of the keyword at all relevant with this? Will it be much harder with certain keywords over others?